Ever since Amazon launched the Kindle last November, we’ve been wondering about just how successful it’s been. The electronic book initially sold out and supplies have been tight. 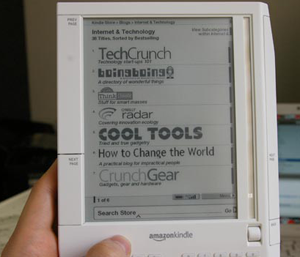 The Kindle is such a small part of Amazon’s overall business that the company does not break out how many it’s sold. But we found out anyway: 240,000 Kindles have been shipped since November, according to a source close to Amazon with direct knowledge of the numbers. Doing a little back of the envelope math, that brings total sales of the device so far to between $86 million and $96 million (the price of the device was reduced to $360 from $400 last May). Then add the amounts spent on digital books, newspapers, and blogs purchased to read on the device, and you get a business that has easily brought in above $100 million so far. (Each $25 worth of digital reading material purchased per Kindle, add $6 million in total revenues). These numbers gel with what Wall Street analysts have been predicting. 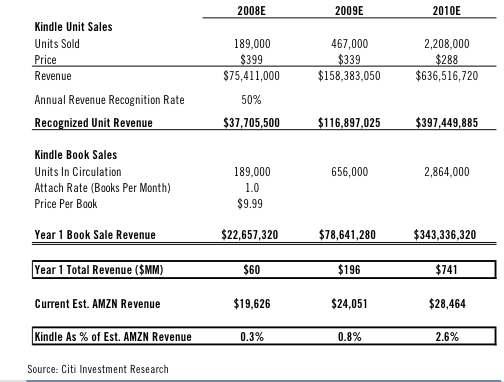 And if a new Kindle comes out targeted at the textbook/school market, sales could ramp up higher. Scott Devitt, an analyst at Stifel, Nicolaus & Co., predicts that Amazon is on track to sell 500,000 to 750,000 more Kindles over the next four quarters (including this one). He estimates that Kindle owners will buy an additional $120 to $150 worth of books and other content for each device, bringing the total revenues over that time period to somewhere between $225 million and $355 million. Based on that, he values the Kindle as a $1 billion business for Amazon.